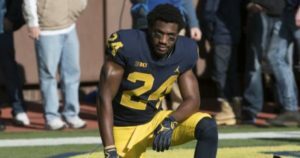 Since quarterback is such an important position in the game of football, I like to take a hard look at whom Michigan is recruiting in each class. I actually started this post a couple weeks ago, but with all the film watching and such, it took me a while to complete it. 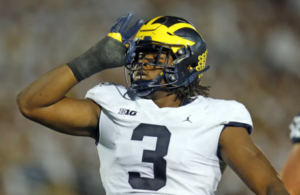 When I evaluate quarterbacks for this piece, I think about how well they would fit in the offense that I expect Michigan to run. 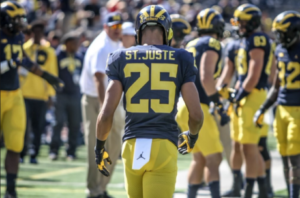 With that being said, there’s some uncertainty going forward with talk that Jim Harbaugh wants more athletic quarterbacks and an offense that employs more wide receivers than we have seen in the past. Harbaugh did have success with a more spread-oriented offense as the San Francisco 49ers head coach, so I tried to keep that in mind when putting together this list. 1. Trevor Lawrence – QB – Cartersville (GA) Cartersville: Lawrence is a 6’6″, 196 lb. prospect who committed to Clemson in December of 2016. He’s also a U.S. Army All-American and the #1 overall player in the country. Lawrence is probably the most “college ready” quarterback on this list. A pro-style guy, he has the size, footwork, arm strength, and accuracy to be deserving of his ranking. The thing that probably sets him apart is his intelligence and pre-snap reads. Lawrence does a great job of identifying coverages and getting rid of the ball quickly when he has an opportunity. In that sense I think he has a little bit of Peyton Manning in him; he’s a very cerebral quarterback. Lawrence isn’t a great athlete and I’m sure the Clemson offense will look different with Lawrence than it did with Deshaun Watson, but he still should be able to command that offense well. Hit the jump for the rest of the list. 2. Matt Corral – QB – Long Beach (CA) Poly: Corral is a 6’2″, 185 lb. signal caller who committed to USC in February of 2016. He’s a 5-star, the #2 pro-style quarterback, and #9 overall. Corral has a whip for an arm, and I mean that in both a good and a bad way. He can fire the ball downfield and hit receivers in small windows, but he also drops the ball very low (think a right-handed Tim Tebow) in his throwing motion. The ball comes out quicker than Tebow’s, but it’s still a mechanical issue and could present opportunities for defenders who are swiping at the ball. Corral is also only 6’2″, which isn’t huge but should suffice. He has some good pocket awareness and a panache that gets me thinking of Aaron Rodgers; both are plus athletes who can make plays with their feet, even if they’re not threats to take over a game by running the ball. Corral’s strong arm is combined with good anticipation and an ability to take something off the ball and feather it softly into a receiver’s hands. His size and throwing motion may hurt him down the road, but the Trojans are in line to get a very good quarterback prospect. 3. Artur Sitkowski – QB – Bradenton (FL) IMG Academy: Sitkowski is a 6’5″, 215 lb. prospect who committed to Miami in February. A transfer from New Jersey, he’s a 4-star, the #4 pro-style quarterback, and #72 overall. Sitkowski gets my “Most Improved Player” stamp of approval, which isn’t a thing but we can pretend it’s a thing. 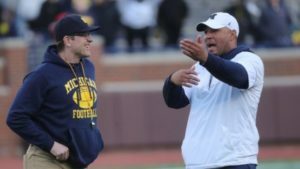 He camped with Michigan’s staff last summer, and I was indifferent. Fast forward a year and he looks like a potential star. His body has filled out, and that seems to have improved his arm strength. Footwork and mechanics have also improved, and he has a strong, quick, over-the-top delivery. The most impressive thing with Sitkowski at this point is how quickly he gets through his progressions. You can see him look to one side of the field, see coverage he doesn’t like, and then go to the complete opposite side of the field. You also see him make throws before his receivers come out of their breaks, something you don’t see a lot of in high school. His speed and athleticism are adequate, and he’s willing to lower a shoulder once in a while, but he’s mostly a pocket guy. Even when scrambling, he can put some zip on the ball going to either side. 4. 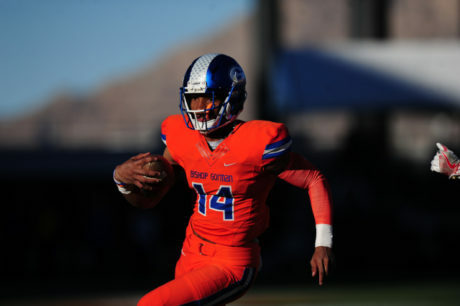 Dorian Thompson-Robinson – QB – Las Vegas (NV) Bishop Gorman: Thompson-Robinson is a 6’2″, 195 lb. 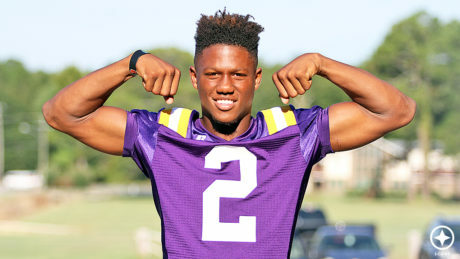 prospect with offers from Alabama, Florida, Georgia, LSU, Michigan, and UCLA, among others. He’s a 4-star, the #4 dual-threat quarterback, and #50 overall. He sat behind Tate Martell (Ohio State) the past two years, so there’s not a ton of film on him and he’s less experienced than most elite quarterbacks going into their senior years. 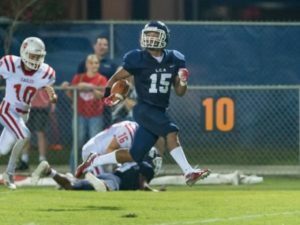 As a junior in 2016, he was just 21/31 for 269 yards, 3 touchdowns, and 0 interceptions; he also ran 22 times for 171 yards and 6 touchdowns. 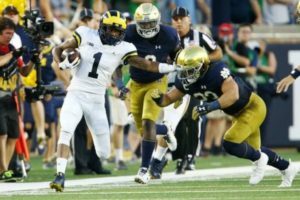 Interestingly, while he was backing Martell up at QB, he was also starting at wide receiver, where he caught 22 passes for 397 yards and 8 scores. 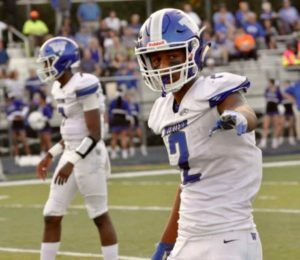 Thompson-Robinson is obviously a good athlete, and while he lists a 4.78 forty time on his Hudl page, it would not surprise me if he has improved upon that. He has good speed and can make defenders miss in small spaces. At 6’2″ he’s not particularly tall, but he does have a high release point. Speaking of the release point, he has a whip for an arm and can push the ball down the field. His footwork from under center can be iffy, and he tends to fade a little bit in his dropback, but those might be attributed to not getting as many reps as most elite guys. Throughout his film, I didn’t see many throws where he had great anticipation or where he placed the ball perfectly. In fact, most of his throws came on simple reads, and his receivers had to work at time to catch his passes. Again, this may be an issue of a lack of reps and timing with his wideouts, but his accuracy might be something to watch down the road. 5. Cameron Rising – QB – Newbury Park (CA) Newbury Park: Rising is a 6’2″, 209 lb. prospect who committed to Oklahoma in August of 2016. He’s a 4-star, the #5 pro-style quarterback, and #83 overall. Rising looks like a good fit for the Sooners, where the quarterbacks haven’t been physically imposing or dominant, but very accurate and smart. Rising is solidly built and has decent height. He won’t wow anyone with his legs, though he’s a competent runner. He should be able to move around in the pocket and occasionally move the chains with his feet, but he’s mostly a pro-style quarterback. Rising has a quick release and a nice over-the-top delivery. He moves his feet well within the pocket and stays active with his lower body, not getting his feet locked into the ground. 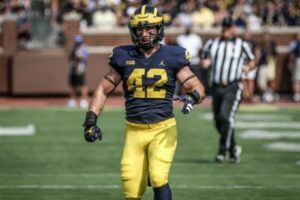 His ability to attack the middle of the field stands out, because his accuracy and touch allow him to drop throws in behind linebackers and in front of safeties. I also like that he can throw the ball going to either his left or his right. 6. 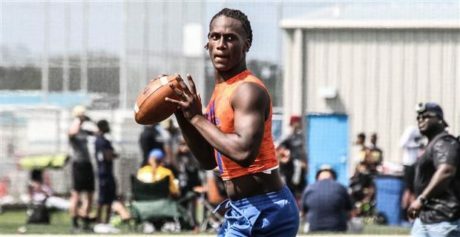 Joe Milton – QB – Olympia (FL) Olympia: Milton is a 6’4″, 222 lb. signal caller with offers from Arizona, Florida, Georgia, Michigan, Missouri, and Tennessee, among others. He’s a 4-star, the #12 pro-style passer, and #301 overall. Right now it looks like he’ll end up as a Florida Gator. He’s a big, strong-looking kid who doesn’t need much physical development for the next level. If you watch his film, you’ll see a couple very strong throws as the right-hander rolls to his left, something that is very impressive. Claiming a 4.69 forty, he’s a decent athlete but not a dynamic one with his legs. 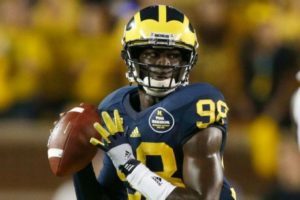 He reminds me a lot of Devin Gardner with the way he moves and throws the ball, though Gardner was a superior overall athlete. I think Milton has a lot of work to do on his footwork, both from shotgun and under center. Instead of stepping up in the pocket, he has a tendency to fade backward, which could be problematic if it’s not fixed. I’d like to see him carry the ball higher and keep both hands on it, too. So there’s some polishing to be done, but overall, I like what Milton brings to the table as a developmental quarterback. 7. 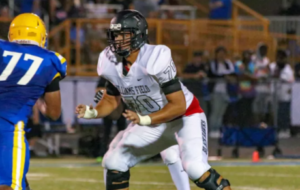 Jack West – QB – Saraland (AL) Saraland: West is a 6’4″, 217 lb. prospect who committed to Stanford in July of 2016. He’s a 4-star, the #6 pro-style guy, and #92 overall. West is a solidly built guy with good height, but he’s in the lower half of this group when it comes to pure athleticism. He has decent arm strength, but not a cannon, and his deep ball can wobble a little bit. Part of his issue seems to be that he’s trying to pinpoint some of his passes rather than just letting them fly. The thing I like about him best is that he’s able to make smart decisions under duress and throw the ball at different angles. However, he seems to be a split second late getting the ball out on standard dropbacks and doesn’t seem to have the same command of his offense as a few other players do of theirs. 8. James Graham – QB – Fitzgerald (GA) Fitzgerald: Graham is a 6’1″, 180 lb. 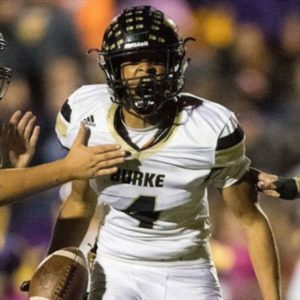 dual-threat quarterback with offers from Alabama, Arkansas, Miami, North Carolina State, and Oklahoma State, among others. He’s a 3-star, the #20 dual-threat, and #610 overall. It’s unclear which offers are for the quarterback position and which ones are for another skill spot, because Graham might not have the chops to play QB at some of the big-time programs. 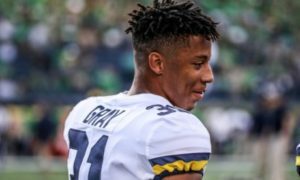 Rich Rodriguez would have been drooling over this kid back in his younger days, because Graham is a speedster with good agility and some surprising strength. I absolutely believe he can play quarterback, just maybe not in a pro-style offense. Most of his throwing offense is based off of shotgun play action and one-man reads. He does have decent arm strength and a smooth delivery, and I like how he keeps his eyes downfield when he scrambles. It would be a departure from most of Jim Harbaugh’s past to land an athlete like Graham as his quarterback. 9. Joey Gatewood – QB – Jacksonville (FL) Bartram Trail: Gatewood is a 6’4″, 232 lb. prospect who committed to Auburn in December of 2015. He’s a 4-star, the #1 athlete, and #93 overall. I am not the first person – nor will I be the last – to make a comparison to Cam Newton. Gatewood is large and athletic, though he’s not quite the 6’5″ and 250 lbs. that Newton is. 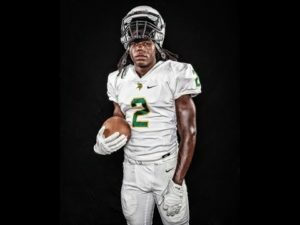 Gatewood is listed as an athlete, and it’s easy to see why. 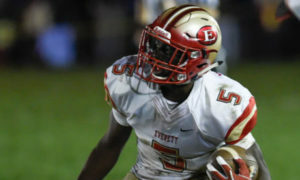 He has a natural running style and could play quarterback, wide receiver, or tight end at the next level. 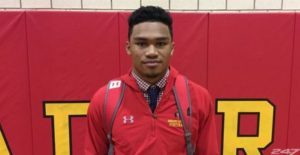 His high school highlights are rife with plays at quarterback, running back, wide receiver, and kick returner, though he isn’t playing high-level high school competition. Unfortunately, he is somewhat robotic as a thrower and lacks great footwork in the pocket. He also is not tasked with making a lot of difficult throws, and his ability to push the ball deep is somewhat questionable. His longer throws tend to flutter a bit. He may be better off switching to tight end sometime down the road, but in the right offense, I think he can succeed at quarterback in college. 10. Jacob Sirmon – QB – Bothell (WA) Bothell: Sirmon is a 6’4″, 218 lb. quarterback who committed to Washington in December of 2015. He’s the son of former Oregon and Tennessee Titans linebacker Peter Sirmon, who is now the defensive coordinator at Louisville. As a junior in 2016, Jacob completed 189/314 passes (60.2%) for 2,799 yards, 22 touchdowns, and 5 interceptions. In watching his film, I was reminded strongly of Chad Henne. 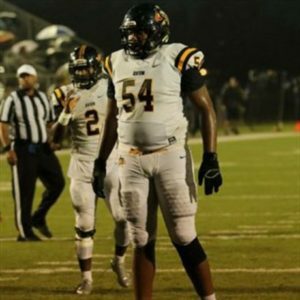 Sirmon is built like a linebacker and has just adequate athleticism in high school, so he will be even more limited when playing on the field with other FBS athletes. His throwing motion reminds me of Henne, and while I don’t think Henne threw off his back foot as much, they put a similar trajectory on their deep balls. The ball can also flutter at times, and Sirmon struggles to put a ton of zip on the ball when he’s scrambling. He shows good footwork and drives through the ball when he can get rid of it on time, but I think he could struggle if defenses can put pressure on him. 11. Allan Walters – QB – Hightstown (NJ) Peddie School: Walters, a transplant from Paramus (NJ) Catholic after his sophomore year, is a 6’1″, 200 lb. prospect who committed to Vanderbilt in December of 2016. He’s a 4-star, the #11 pro-style quarterback, and #271 overall. Walters is a rather nondescript looking player without great size or elite athleticism. He really needs to work on loosening up his lower body, as he tends to stand with his knees locked and very stationary in the pocket. His ball handling could use some work. Running is not his strong suit, and he lacks the speed or instincts to be much of a threat on the ground. On the plus side, he can put the ball on a rope and push it downfield. He throws a deep ball with plenty of air under it. I also like his competitive streak. There are a couple times on film where he lowers his shoulder while running, and one play where he obliterates a defender on what looks like a punt return. Fun read. I enjoy these. Quick typo for the DTR review. Should be Tate Martell instead of Forcier. Thanks. I’m firing my editor. Well done. Am I the only one not confident it our realistic options this cycle? Thanks. I’m not confident, either, but Steve Lorenz was more positive about our chances with Dorian Thompson-Robinson yesterday than others have been. So who knows? kinda seems doubtful we’ll get any of these guys. what about theo day? Michigan just offered Chandler, Arizona QB Tyler Shough. What’s your evaluation of him? He’s okay. I don’t think he’s stellar at any one particular thing. He needs a lot of work on his mechanics (footwork, pocket stature, etc. ), but he’s a decent athlete with a good arm. I would probably put him in the lower half of this list. Recruiting rankings don’t like him and he’s another “pro style” QB. I’m sure he has good qualities and high potential, but after Sitkowski and DTR seemed like reasonable options for a while, this feels like a bit of settling. No worries though with JH in charge. You take the best available guy each year and develop them. 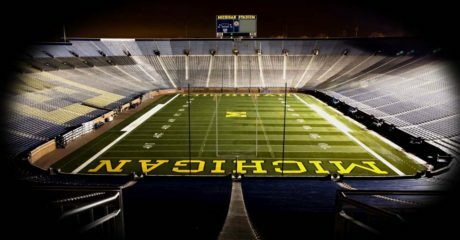 We’ve gotten good seasons out of guys like Rudock and Speight, so you can assume the hand-picked recruits will eventually produce. I’m a little surprised blue chip QBs are fighting to commit to Michigan sooner. Perhaps the transition in QB coaches has hurt a bit. 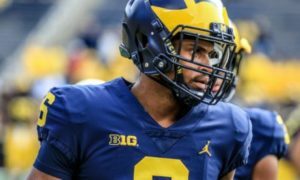 A Heisman-caliber season from Speight would be a big help, one would think. Agree. We’re doing fine by national recruiting rankings the last two cycles, but I would have guessed QB & OL would have lined up to play under JH & Drevno. Add in Pep? He throws a series of nice deep balls on his reel. Has a clue about when to touch and when to gun it. 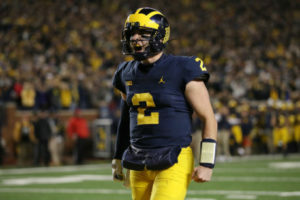 His release is never going to call to mind Dan Marino, and maybe not even Wilton Speight, as every once in a while he just flat out takes a full wind up before he brings it forward but ….. Harbaugh. That sudden little cut back move he has running the football doesn’t look all that deceptive from the press box, but he gets past people, over and over and over again. I dunno, bad tackling in the desert? An all-time sleeper of a move? There’s something going on there. Do you like DTR more than Milton? His 40 seems to be slower…and if they were equal talents, I would probably go with the 6’4 220lb option. Having a relative that played for Harbaugh shouldn’t hurt either, having Boldin around the program potentially. DTR has the advantage of coming from a power program, so I get that pull. Thoughts? I have Dorian Thompson-Robinson ranked #4 and Joe Milton ranked #6. I would be satisfied with either one. I think Thompson-Robinson is a more dynamic player with his feet, while Milton is one of those guys who can run but isn’t a real dual-threat type of guy. It’s kind of like J.T. Barrett vs. Cardale Jones. Either way, I don’t think Michigan is going to establish a pipeline to Bishop Gorman. There’s always going to be a pull to stay out west for those kids, so Michigan might get one or two kids, but it’s not going to be a Cass Tech-to-Michigan type of situation. I think it’s important to get at least one QB in this class but we’ve recruited two really good ones the last two years so I’m not really worried about the position. I hope he can block and catch. Was Shough considered for this piece? I’m not sure if he was scouted much when you wrote this. If not, would he make this list? If so, where? I didn’t consider Shough for this piece, because he hadn’t been offered at that point. He would be somewhere in the bottom half, below Milton, who’s #6.